The National Living Wage (NLW) will lead to a pay increase for more than 128,000 employees in NI by next year, new research has suggested. The NLW was introduced in 2016 and is effectively a new minimum wage for workers aged 25 and over. 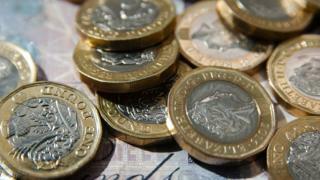 It was set at £7.20 per hour with the aim of rising to about £8.60 by 2020. The research, from the Ulster University Economic Policy Centre, suggested the higher wage could also lead to a small number of job losses. It also concluded that the overall economic effect of the NLW will be slightly negative, due to the costs it imposes on businesses. The study found that employees in the hospitality industry will be the major beneficiaries - more than half the workforce in that sector will get a pay rise. Other sectors where a large proportion of workers will benefit are retailing and administration. Employers will have to adjust to the NLW in a variety of ways such as reducing profits, increasing prices, improving productivity or cutting jobs. The study suggests that, given the relatively high proportion of lower paid jobs and lower profit margin businesses in Northern Ireland, some job losses are likely. However, it estimates these to be at a very low level, less than 700 or 0.09% of the Northern Ireland labour force. Aside from examining the data, the Ulster University researchers also spoke to Northern Ireland business representatives. The feedback from that consultation suggests the impact of the NLW has been less severe than first anticipated, although that has varied between sectors. Skill shortages have been a bigger issue for businesses, with market forces rather than legislative requirements increasingly requiring businesses to increase pay. In terms of the overall economic impact the central estimate is that the NLW will provide economic benefits of £80m through additional earnings and improved productivity. However the costs of job losses and other adjustments by businesses are estimated at £153m, giving an overall economic cost of £73m or about 0.18% of total economic output. The study acknowledges that the NLW is intended to support wider societal benefits, such as making work more attractive and helping to reduce inequality. Jordan Buchanan, one of the authors, said: "It isn't just about the economic benefits. "All workers should be paid a fair wage. So far, the evidence suggests that the National Living Wage has been successful in raising pay for many in society without causing unemployment. "There is a social/inclusivity benefit in terms of greater wage growth for the 'working poor'."